THAT'S RIGHT! 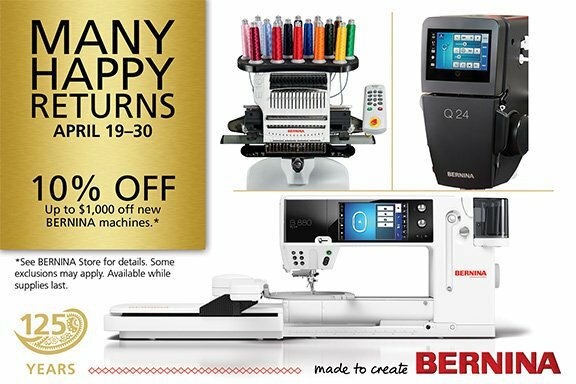 Get 10% off up to $1,000 off of a new Bernina sewing machine! We also have 48 Months, No Interest with Equal Payments April 19-30, so now is a great time to get that new machine you've been wanting! Click here to apply for financing today! In other news, WE HAVE ONE 590E DEMO AVAILABLE. Get a discount on a this all new Bernina 590E with Dual Feed because it was used in a class! Our demo models come with full warranty, just like a new machine, and they've been pre tested in classes. The Floor Model Cabinet sale continues through April 30th! This is the prefect time to get the furniture that will make the work space in your sewing studio just a dream to use and great looking too! Hurry in because they are going fast. We can't believe how fast the floor model cabinets have been selling! And remember we provide free OKC Metro Area delivery and set up.